Wootton works for win against Einstein in season opener 25-5, 25-11, 26-24. 1. Having navigated the clutter of bad weather, rescheduled tryouts and assorted other preseason noise, the Wootton boys finally had the opportunity to play a game of serve, block, pass, set, hit. Simple, eh? 2. Whereas the Patriots clashed against teammates in competitive preseason training sessions, that discord turned to team harmony against a common foe in Einstein's gym. Competition in the practice gym sharpened the Patriots' focus against a tall, athletic and well-coached Titan team. Every Patriot earned court time to add their note to the harmony. 3. As the match progressed, the Titans took it to the Patriots with a stronger serve and net game. In a hard fought third set, the Patriots found opportunity to learn composure in the middle of difficulty. Down late in the match with the Titans applying pressure, the Patriots responded by steadying their ball control. It was an opportunity to learn a bit about resolve. Seniors Paul Malinauskas and Ben Wang paced the Patriot offensive attack choreographed by senior setter Cary Chin. Senior David Li was strong off the bench as one of the cadre of hard-hitting outside hitters, including juniors Mark Pang, Andrew Merchant and Jeremy Chung. Juniors Ethan Frymark, Adam Kaplan and Robert Severynse assumed roles to provide strength and depth in key positions. 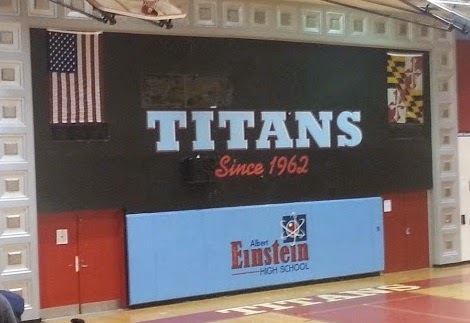 Kaplan at libero steadied the passing and transition game; Frymark as middle blocker in set 1 and setter in set 3 added a unique dimension to Wootton's lineups; Severynse contributed his aggressive net game as a middle hitter. Sophomores Jimmy Ho and Nathan Xie began their Wootton volleyball careers smashingly as left-side hitters while Justin Wu picked up from last year as a defensive specialist, then adding few rotations at middle blocker to his repertoire. Freshmen Omar Nunez and Victor de Avila were impressive in the middle. A man who has a school named for him (I know, there is more to Albert Einstein's legacy) must know a few things about how the world works. Albert Einstein would have been a good volleyball coach. He not only would follow his own rules of work, but he would also consider space and time in relation to each other to run an effective quick tempo offense. The Patriots return home against Quince Orchard on Monday, March 24 at 5:15 pm.